The first and most obvious conclusion is that after a period in the 1950s and 1960s of believing that aircraft-mounted guns would be made obsolete by missiles, all fighter aircraft are now fitted with them. The main reason for this is the flexibility of the gun. It can be used for air-to-air and air-to-ground fighting, will not be deflected by the electronic or thermal countermeasures used against missiles and provides a backup for when the missiles run out. The lack of range in comparison with missiles is less significant than was imagined, because most modern conflicts are carefully limited, with rules of engagement which require visual verification of the target before opening fire. The enormous ranges achievable by many air-to-air missiles can therefore rarely be used. Also, while the size and weight of combat aircraft has tended to increase, that of aircraft cannon has not, so fitting one of the modern single-barrel cannon carries only a small payload penalty. Fighter guns have therefore continued to flourish, albeit in various different directions. It is puzzling that the USA has retained both the 20mm calibre (with the exception of the primarily ground-attack weapons) and the rotary cannon, which together with its ammunition feed arrangements is a very bulky package to accommodate. All other fighter-producing nations have selected compact single-barrel cannon in much harder-hitting 25-30mm calibres (with up to four times the projectile weight of the 20mm) as the most appropriate equipment for such aircraft. The theoretically lower rate of fire of these cannon, ranging in current models from 1,600 rpm to 2,500 rpm, is compensated to some extent by the instant acceleration, while even the best externally powered rotary guns take time to reach the maximum rate of fire. To give an example, the M61A1 reportedly fires only eighteen rounds in the first half-second (the lighter, but so far not in service, M61A2 can double this). 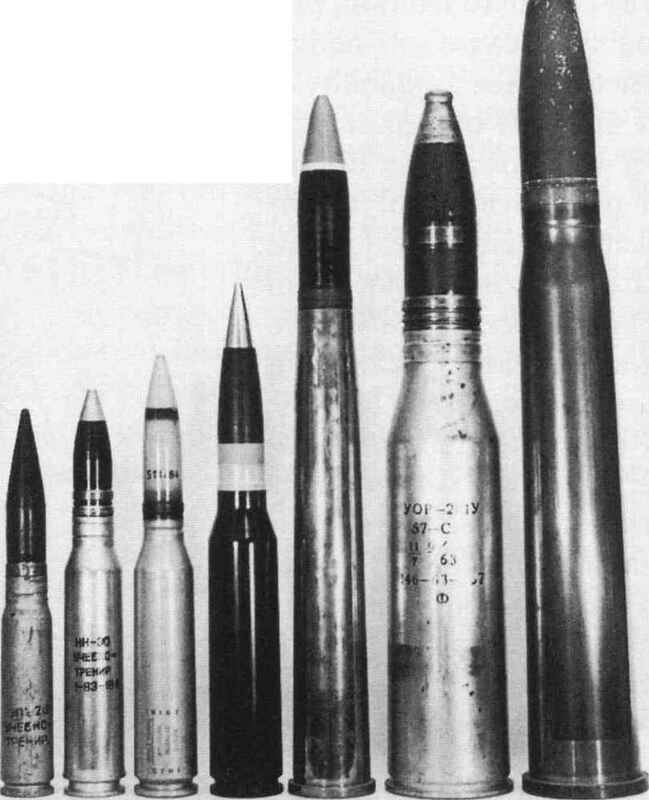 This amounts to a total weight of projectiles fired of 1.8kg (3.6kg for the A2). In comparison, the BK 27 fires fourteen rounds weighing 3.7kg, while the new GIAT 30M791, a little heavier but far more compact than the M61A2, fires twenty-one rounds in the same time for a weight of 5.7kg. Even more remarkable is the Russian GSh-301; this may only fire thirteen rounds in the first half-second but each projectile is nearly four times the weight of the 20mm, giving a total weight of fire of over 5kg, from a gun which is significantly smaller than the GIAT and less than half the weight. Even once they have accelerated to full speed, neither M61 version can beat the Russian gun in firepower, yet they weigh over twice as much and occupy many times the volume. The USA is reportedly developing rotary cannon using cased telescopic ammunition for the possible replacement of the 20mm guns in the F-22 and RAH-66, but that is unlikely to happen for some time. HEDP ammunition, has been selected by the Boeing-led team and at the time of writing was a possible choice for the Lockheed Martin competitor. Logically, the future of fighter guns should be secure. Not only will the widespread use of stealth technology reduce target acquisition and therefore combat ranges, but the introduction of thrust vectoring means that aircraft attitude will no longer be tied to the direction of travel. This will make it much easier to aim the gun, as the aircraft can rapidly be pointed in the right direction. However, some recent decisions by the RAF give cause for concern. First, the failure of the Aden 25 means that the Harrier GR.7s are likely to remain gunless (although there seems no technical reason why the BK 27 should not be used instead). Second, it was announced in May 2000 that for reasons of cost, the RAF's Eurofighter Typhoons would not utilise the planned BK 27 installation. It is hoped that the RAF does not have cause to regret these decisions in future conflicts. For ground attack, both Russia and the USA have specialised aircraft fitted with high-velocity 30mm guns to supplement their missiles and bombs, although the USAF's future commitment to this type of aircraft is in question. During the Gulf War, the USAF's A-10 aircraft reportedly made relatively little use of their formidable GAU-8/A cannon, preferring to use guided missiles because their much greater stand-off distance minimised the risk from Iraqi AA fire. The claimed penetration of the 30mm DU round is 76mm at 700m, which is marginal against the ever-thickening top armour of modern battle tanks. The Russians have tried larger-calibre weapons for ground attack, tests having been conducted with a 45mm TKB-700 smooth-bore automatic cannon designed for the Su-25, but so far without result. The most varied range of weapons is in the field of helicopter armament, with every type of gun up to a high-powered 30mm being available, in flexibly mounted, turreted, fixed or podded forms. The reason for such variety is probably the relative lack of major combat experience with attack helicopters, those occasions when they have been used being rather one-sided affairs. One must hope that our air forces do not have the opportunity to acquire such experience in the foreseeable future. It seems evident, however, that a quickly responding cannon will remain of value as attack helicopters inevitably evolve to fight each other as well as their original ground targets. Pilots are trained to keep low and make full use of cover, so engagement opportunities are likely to be fleeting and at short range. The introduction of the new Mauser RMK 30 recoilless gun may well alter the limits which normally apply to such powerful weapons, as it appears to be ideal for helicopter installations. The design permits a relatively light and compact weapon, with a light and simple mounting as recoil does not have to be absorbed. Furthermore, the lack of recoil movement also permits a high degree bf accuracy, which means that a lower rate of fire can produce the same effect, and less ammunition therefore has to be carried, saving yet more weight. It is, of course, less suited to internal mounting in fighter aircraft because of the low rate of fire and the problems of dispersing the gas ejected from the rear, but podded versions could make an interesting underwing load for light, propeller-driven COIN aircraft. Finally, it is worth noting that the large-calibre (over 30mm) airborne cannon concept is not quite dead. They were never an unqualified success, except for limited periods when circumstances favoured them, such as anti-tank use on the Eastern Front in Second World War. Despite this, the idea refused to go away and has led to the sporadic reappearance of such weapons. Undoubtedly the most spectacular modern example is the Lockheed AC 130 Hercules gunship, fitted for special operations with a variety of ground-attack guns including 40mm Bofors and even 105mm howitzers. Parallels can be drawn between these and the First World War and inter-war 'battleplane' concept. Those who believe that nothing is really new but is merely reinvented in different forms will enjoy the thought that the US Army's M129 40mm automatic grenade launcher, flexibly mounted in various attack helicopters, is remarkably similar in purpose and broad performance specification to the Vickers 37mm 1 pdr Mk 111, one of the first automatic cannon ever to see airborne service.